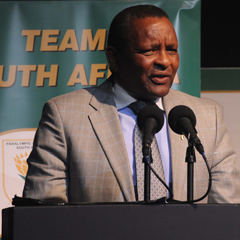 London - SA Sports Confederation and Olympic Committee (Sascoc) president Gideon Sam believes the country left a few medals behind at the London Olympic Games. "For me it is a success in some ways, but also in other ways I feel we left the medals behind; the medals were there for the taking," Sam said. "At this level you don't do that; when the medal is there for the taking, you take it." South Africa concluded this year's global showpiece as their most successful Games since re-admission to international sport in Barcelona, in 1992. The team returns to South Africa with three gold, two silver and a bronze medal to end off their most successful post-apartheid Games. Sam said the team could have been close to reaching their target of 12 medals had the pre-Games medal contenders produced the goods. "I mean it was centimetres away for Sunette Viljoen, four no-jumps for Khotso Mokoena, and LJ van Zyl not making it through the heats," he said. "I was looking at Burry Stander yesterday, and I thought two more mountain bikers on our side could have helped him and kept him in the loop there, but he had to do it himself." South Africa nevertheless ended the Games as the highest African nation in the medals table, in 24th position. While Sascoc had set a goal of 12 medals, the six medals the team won in the English capital was a marked improvement from the 2008 Beijing Games where Mokoena's silver was the only medal won. The bulk of South Africa's medals came from water-sports, with swimming winning three while rowing and canoeing each won a medal. Women's middle distance ace Caster Semenya was athletics' only medallist after she finished second in Saturday's 800m final, while Bridgitte Hartley won a bronze medal in the K1 500m race. Cameron van der Burgh broke the ice - and a world-record - in the pool, winning the gold medal in the men's 100m breaststroke. The 20-year-old Chad le Clos then became an overnight international sensation when he beat Michael Phelps by a whisker for his gold in the 200m butterfly. Two nights later, the flipper was on the other foot, with Le Clos finishing second behind Phelps for a silver medal. The men's coxless lightweight fours rowing team of Sizwe Ndlovu, Matthew Britain, John Smith and James Thompson carried the momentum forward when they won a gold medal in their event, and South Africa shot up the medals table. The country experienced a slight lull in the second week, with the track and field athletes failing to live up to expectations. Viljoen finished in fourth place in the final of the women's javelin, while South African record holder in the men's 400m hurdles Van Zyl failed to progress past the heats on the first day of the athletics. Mokoena, South Africa's only medallist at the 2008 Beijing Games, struggled with his run-up rhythm and recorded four fouls out of his six jumps, to finish in eighth place. However, Semenya saved athletics' blushes with her silver medal run on Saturday. The Games will also be remembered for Oscar Pistorius's historical participation as the first amputee to compete on the track at the Olympics. He reached the semi-finals of the men's 400m sprint and reached the 4x400m relay final. The SA relay quartet did not finish their first-round race, with Ofentse Mogawane falling before he could hand the baton to Pistorius. They were reinstated after a member of the Kenyan team was found to have tripped Mogawane, and they were given a ninth spot in the final. They went on to finish eighth. It was also the rise of sprinting sensation Anaso Jobodwana, who ran in the men's 200m final with Jamaica's Usain Bolt, finishing in eighth place.